Feel free to comment below or tag me in the post, so I can check it out and maybe share it on Twitter. Sometimes there are signs. Or things I can’t help but interpret as signs. Maybe from fate or the universe or God, if there is one. Or maybe from the grandmother I barely knew but who I’ve always been told is in heaven. 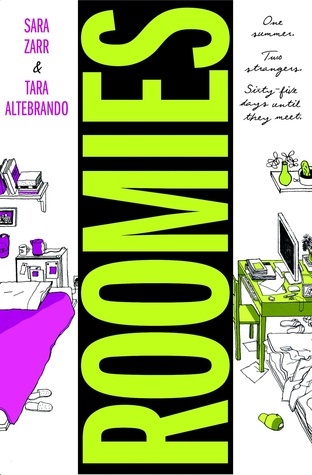 I picked up Roomies from the library not long ago – the attractive cover caught my eye, followed by the disappointment that the book shared a similar premise as a story idea I had with a friend recently. Flicking though the pages, there are so many different fonts and type of interactions in this book, which I think will make it really exciting to read… when I get round to it. I still need to finish Matilda for Book Club, The Road to Nerdvana by L-J Clements (you can read my Q&A with the author here) and Harry Potter and the Cursed Child before I pick up anything else! Liked this post? You can browse the archive of all First Lines Fridays posts by clicking here – enjoy!